Cassandra Clare has done it again: she's produced another book with a title that starts with C.
After reading City of Fallen Angels, I was disappointed. It seemed like it was just tacked on, because the story finishes so nicely at the end of City of Glass. (I mean, bring the bad guy back from the dead? Really?) Anyway, my confidence in Cassandra Clare has been completely restored by this book. I picked it up while I was midway through another book which shall not be named at this time, and I was hooked. It starts off with a bang and never stops moving. The idea of the Shadowhunters and the Clave is the same as in the Mortal Instruments series, but the book is set in London. It is historical fiction, but it doesn't read like it; the only historical thing that stood out for me is that they have maids and they wear dresses. Tessa is rescued by Will (the equivalent of Jace in this series, I'm feeling) from two sisters who have trained her to use her powers and are planning to marry her off to a mysterious man called the Magister. Tessa has the power to Change, which means she can take on the form of other people. At the Institute, she meets girly Jessamine, secretive Jem, strong Charlotte, and head-in-the-clouds Henry (nice alliteration? Why thank you). She's determined to rescue her brother, who is imprisoned by the Magister. She has to learn to use her power to defeat the Magister and his automaton horde. This book does require a bit of what my drama teacher calls 'suspension of disbelief'. Which means, you have to pretend you haven't read anything by Cassandra Clare before. I know that it bothers a couple people that the characters are pretty similar, but hey, she had a pretty darn good formula before so I don't mind if she more or less follows the same one! So suspend your disbelief, read this book like you don't now what else she's written, and devour the traditional Clare fare: hints of romance, lots of fighting, snarky comments, and an intriguing and terrifying enemy. The twists that the plot take left me wide-eyed and clutching the book for dear life- and the descriptions of the automatons (especially when they shred their fingers) are just chilling. (Yeah, that was a spoiler). What's really great is that even though there are enough loose ends to send me sprinting for the bookstore, the book doesn't seem like its only role is to set up the rest of the series; it's complete in itself. The one thing I'm going to complain about is the names. I mean, Mrs. Black and Mrs. Dark, the Dark sisters, the Dark House- really? Really? 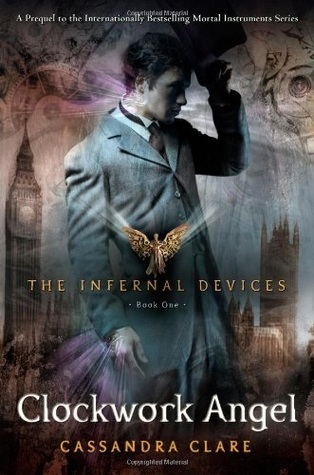 If you like a light, fast paced read with lots of action and a plethora of secrets, Clockwork Angel won't disappoint.